This is one of the more ingenious recipes in Joy of Cooking. In a bowl, combine crumb crust ingredients. Press into a 10-inch pie or springform pan, and bake for 10 to 12 minutes in a 350°F oven. Cool the crust before filling (can be done in the fridge/freezer). Beat in a large bowl until smoothly blended the cream cheese, peanut butter, sugar, and vanilla. 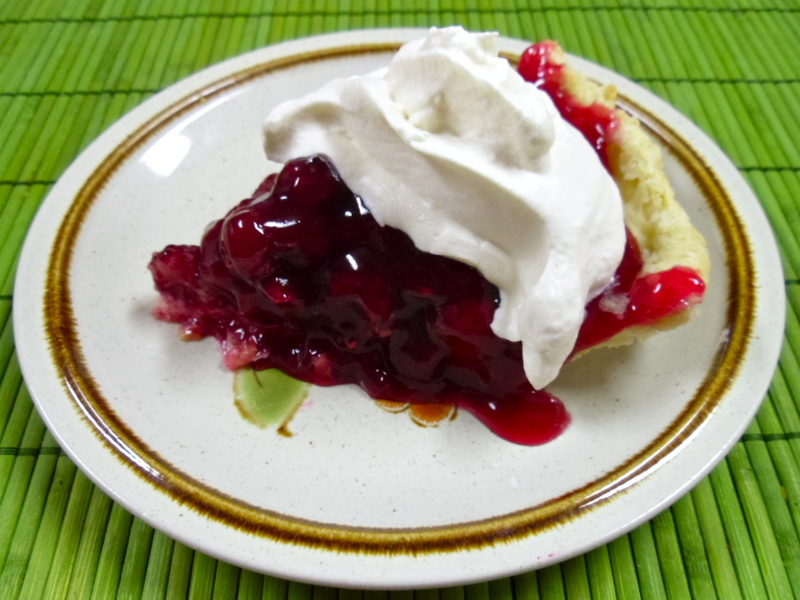 In a medium bowl, beat the whipping cream until stiff peaks form.Using a spatula, fold in half of the whipped cream into the peanut mixture to lighten it, and then fold in the remaining cream. Spread the mixture into the crust, press a sheet of plastic wrap directly on the surface of the pie and refrigerate until firm, about four hours (or if you are in a rush, throw it in the freezer). Bring the whipping cream to a boil, stirring in the instant coffee. Remove from heat and add chocolate. Stir until most of the chocolate has melted. Cover and let stand 10 minutes, then stir/whisk gently until completely smooth. Let cool to lukewarm and then pour over the pie and spread evenly. Refrigerate for at least 1 hour (again, you can also use the freezer) and up to 3 days. 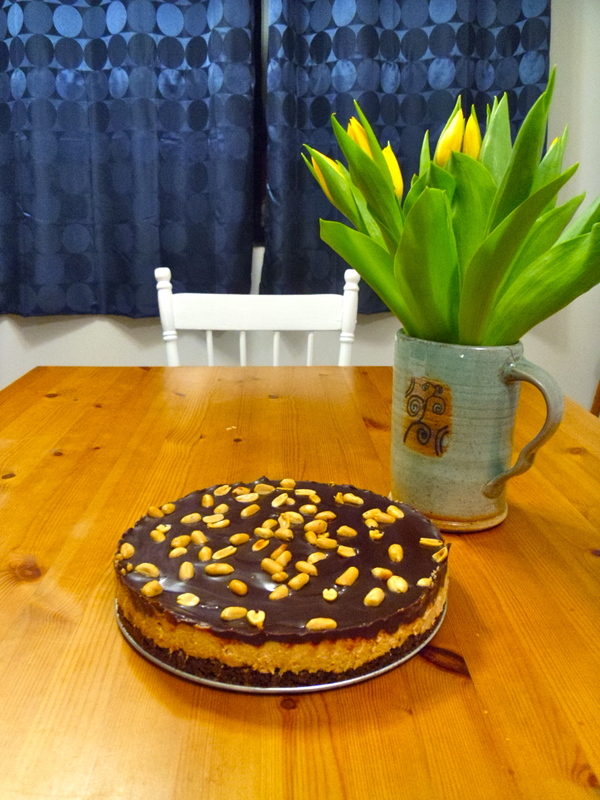 Serve with masses of whipped cream and salted peanuts for an absolutely delicious dessert. Eat slowly – you will want to savour each and every bite! A few of my family and friends have begun to complain about the lack of Canadian cuisine on a blog partially dedicated to Canadian food! 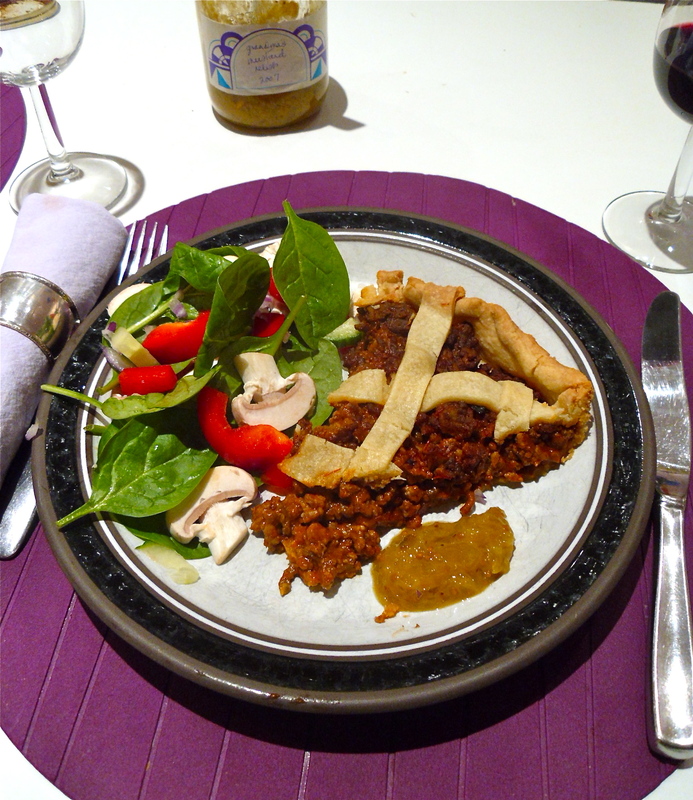 I plan to remedy this over the next few months, but for now, I leave you with a recipe for tourtière, a delightful Quebecois dish. True tourtière lovers are passionate about this dish – some even refusing to call certain meat pies tourtière if they are not “authentic” enough. I myself am not fussy about the recipe as long as it is perfectly moist! There is nothing more disappointing after smelling this dish than to take your first bite and despair at its dryness. Luckily, my grandmother’s recipe is the antithesis of dry tourtière – deliciously moist and full of flavour, there is everything to love about this meat pie. 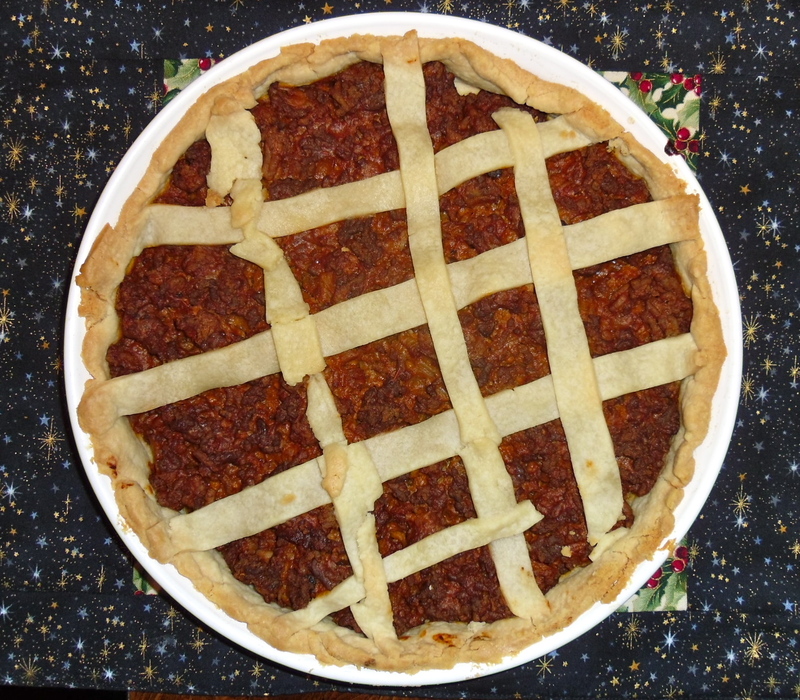 Instead of a double crust, I often oft for a lattice, which is far prettier and makes for lighter dinner fare. While many people use broth to moisten their pie and spices such as cinnamon and cloves to spice it, this recipe’s secret ingredient is cream of mushroom soup. It adds just the perfect amount of creaminess, while retaining the richness in flavour. This recipe makes enough for two pies, so we traditionally savour this dish on Christmas Eve, freezing the second one to enjoy a few weeks later! Brown meat and onions. Drain fat, add remaining ingredients, and cook over medium heat for 45 minutes. (If you taste test at this point, don’t worry if the flavour is slightly odd – as it simmers, the flavours will mellow and meld together beautifully). Cool meat mixture. Meanwhile, roll out pastry to fit pie plates. Divide meat mixture evenly between the two pies, and top with pastry (or lattice). Pierce pastry with fork to create steam vents. Brush the pastry with beaten egg white. Bake at 400 F for 20 minutes. 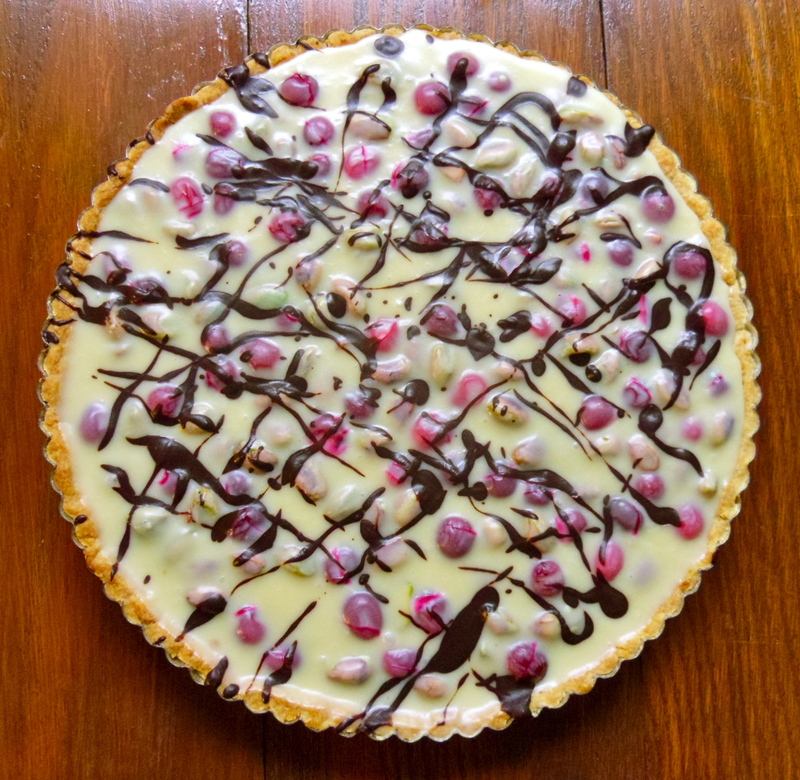 Let pies cool slightly and enjoy! Delicious served with pickled mustard relish or fruit chutney. 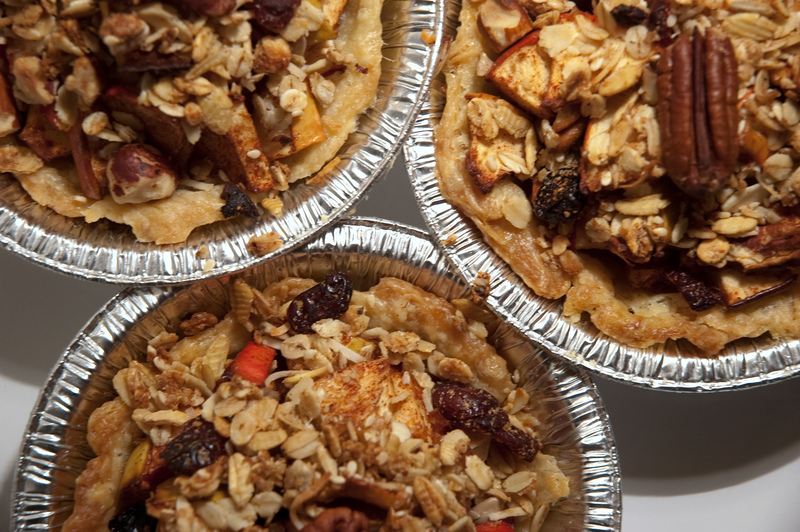 To freeze pies: cool, wrap, and freeze for up to three months. To serve, thaw overnight in fridge and reheat before serving. Thanksgiving is perhaps my favourite holiday of the year. I love the crisp air and colourful leaves and changing of the season. More than any other holiday, I love the meaning behind this tradition – to reflect upon and give thanks for the blessings in our lives. And importantly, it’s a great excuse to cook up a turkey feast to be served with good wine and eaten with good company! If I survive my thesis proposal defence this Friday, my friend Alex and I will be cooking Thanksgiving dinner for just over a dozen friends this weekend. No Thanksgiving dinner is complete without pumpkin pie. 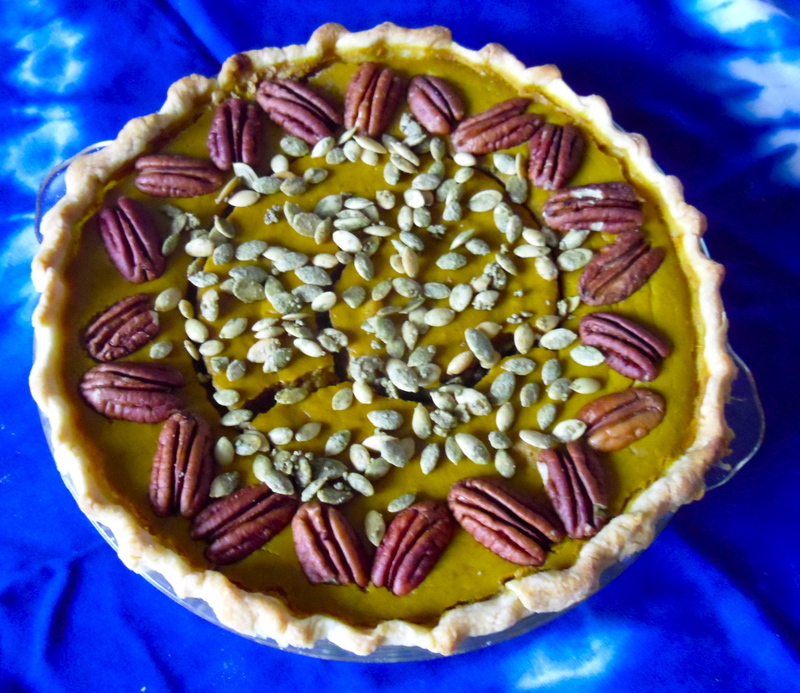 Last weekend, I celebrated “Fake Thanksgiving” (one can never eat too many Thanksgiving dinners) – and decided to use the opportunity to test Silver Palate’s pumpkin pie recipe. 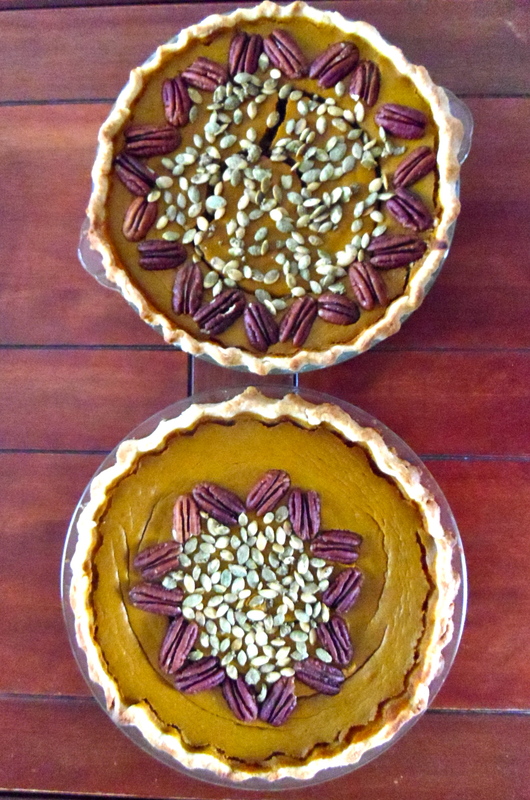 Perhaps the only thing better than one pumpkin pie is two. Like any Silver Palate recipe, this pie was decadent, spiced to perfection and filled with a scary amount of cream (who would dare count calories on Thanksgiving anyways?). When I doubled the recipe, I had extra purred pumpkin, so I just added the extra to the filling, and the pie was extra pumpkiny. One dangerous find was caramelized roasted pumpkin seeds from the Halifax market, which added a lovely crunch. 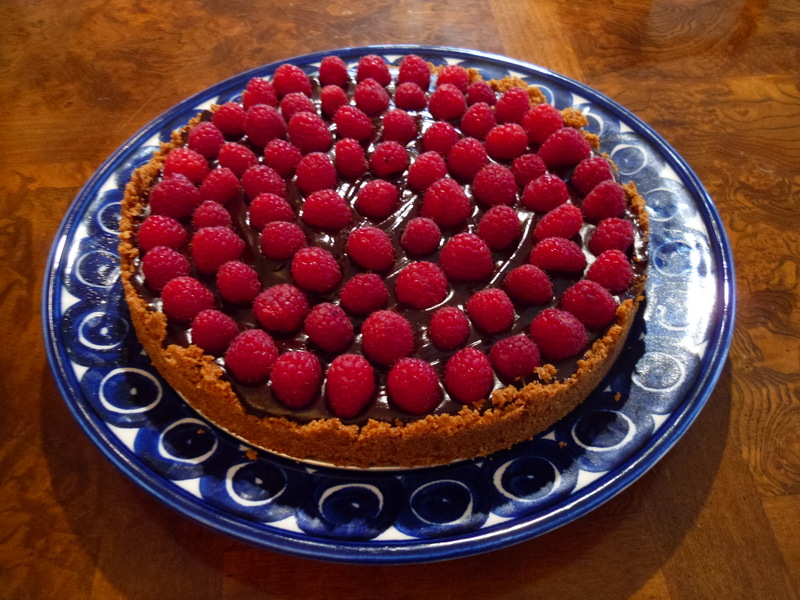 Served with whipping cream, this recipe aced the test, so I’ll definitely be whipping up another two pies this weekend for the real deal! Preheat the oven to 450 Farhenheit. Beat the eggs and both sugars together in a mixing bowl, until light and fluffy. Stir in the pumpkin puree, spices, and salt and mix thoroughly. Stir in the cream and half-and-half. Roll out the pastry on a slightly floured work surface and line a 9-inch bake pan with it; trim and crimp the edges. Pour in the filling. Bake the pie for 8 minutes, then reduce the heat to 325 Fahrenheit and bake until the filling is set and slightly puffed (a knive inserted in the center will come out clean), another 40 to 45 minutes. 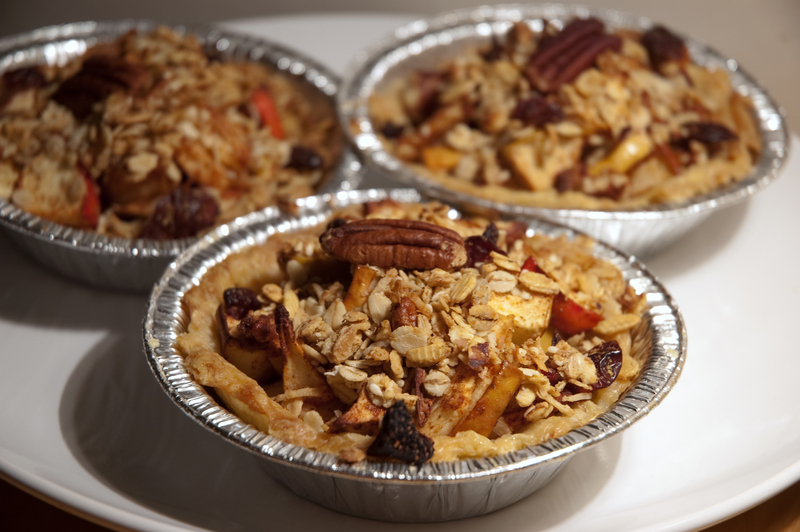 Arrange the pecan halves decoratively around the edges, pressing them lightly into the warm filling. Cool completely before cutting. Delicious served with whipped cream! You know you have had a spoiled week when you get to eat peach pie twice in one week. Ontario peaches are at their height, so it is certainly worth enjoying them! This past weekend, two of my closest high school friends visited Ottawa – one who currently lives in Vancouver and the other who had spent a large part of her last two years in Switzerland and Italy. 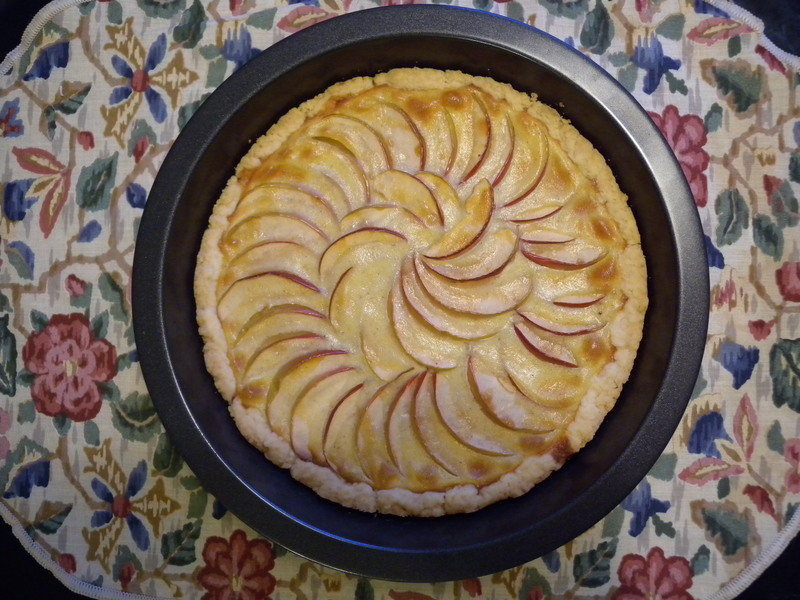 We spent a lovely weekend at my cottage with two other good friends, where among playing cards, canoeing and swimming, we ate a delicious peach pie for dessert. This past week was the last for my summer practicum. 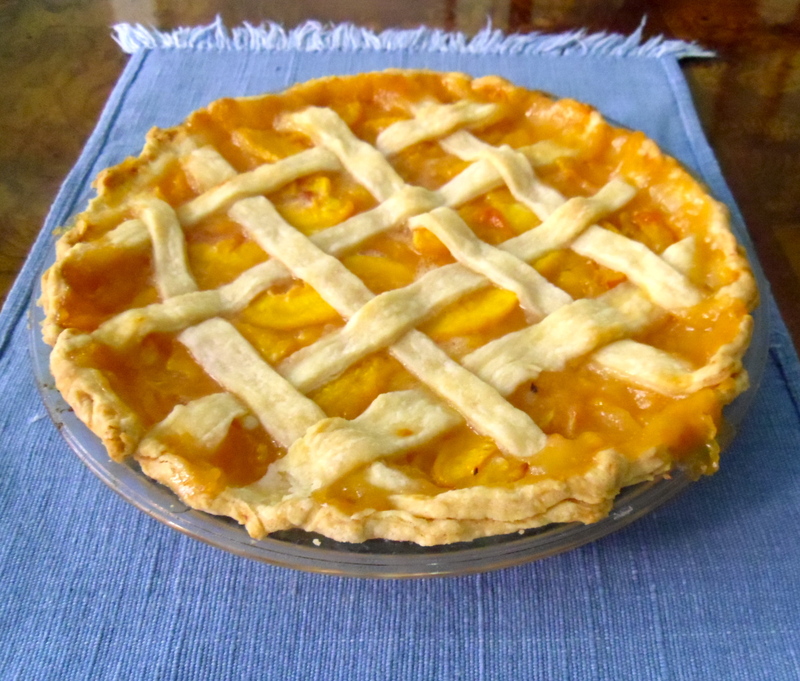 With ripe peaches in the kitchen and skies threatening rain (suggesting perhaps I should drive instead of risk a 30 km bicycle commute), I decided to bring in a peach pie to share with my colleagues. 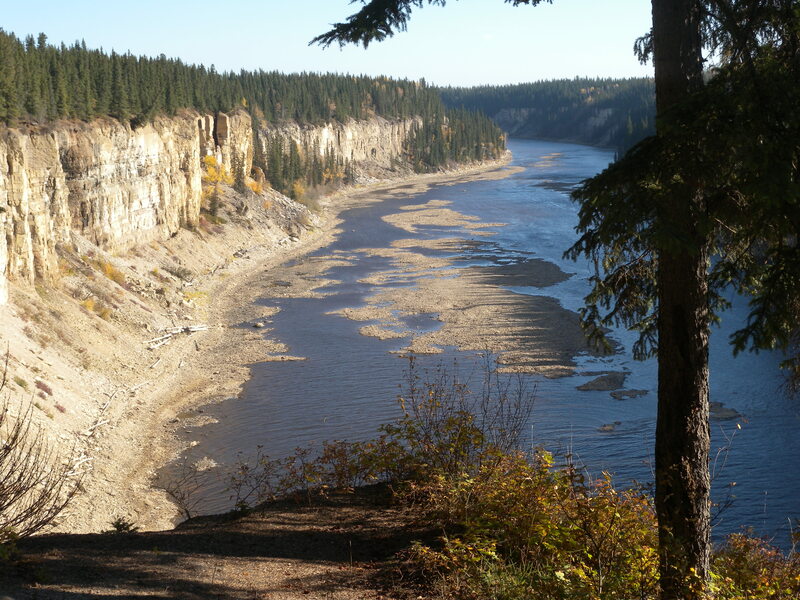 I am sad to be leaving my position, but also excited to soon be back in Halifax to work full time on my thesis. This peach pie is remarkably simple, without other spices, allowing the peaches’ flavour to shine through. The riper the peaches, the juicier your pie will be. Served with a touch of ice cream, you certainly cannot go wrong. Bon appétit! Meanwhile scald the peaches . (To scald them, place the ripe peaches in a large bowl and cover with boiling water. Allow them to sit for a minute or two, before using a paring knife to gently peel away the skin, which should mostly fall off). Slice them into a bowl before adding the sugar, flour and lemon juice. Add a little extra flour if the peaches are particularly ripe and juicy. Transfer the mixture into the rolled out piecrust. Weave the lattice over the peach filling. Bake the pie for about 45 minutes or until the pie is bubbling and crust is lightly browned. (If you are worried that the filling will boil over, place a tray on the oven rack underneath the cooking pie). Cool and serve!